The Icing Onset Sensor is a flush mount sensor for aviation applications that detects initial onset of icing and indicates when critical ice levels are reached. It uses capacitance based technology to continuously monitor for the onset of icing. The sensor consists of a copper electrode pattern embedded in a polyimide laminate which is attached to the airfoil surface. A typical sensor patch measures 1.5" chord-wise x 4.5" span-wise. In custom applications, these dimensions are tailored in accordance with the leading edge curvature, angles of attack, and icing prone region. A small electric field is setup on the surface of the sensor. The presence of ice on the sensor alters the field characteristics. A small electronics box contains circuitry that monitors and interprets the electric field signals. The box can be located remotely from the sensor and connected via small coaxial cables. A display is provided as a small cluster of indicator lights. 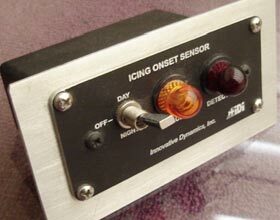 A Trace light comes on when 0.05" ice is detected and remains on as long as ice is present on the sensor. An Ice light comes on when the ice pack becomes thicker than 0.25". IceCapTM is a surface mounted electronic sensor that reports the surface condition of roadways, pedestrian walkways and equipment. This system detects traction hazards including ice, snow, or water in real-time. It can also be configured to provide road surface friction information.